Since the earliest times one of the brightest lights in the heavens has been that of Jupiter, mythical king of the gods and the largest planet in the solar system. It was only natural that peoples from the dawn of history would be interested in such a planet and, indeed, Jupiter was one of the first objects to be observed with the telescope. Even today Jupiter captures the public interest like no other planet: a vast gaseous world, home to violent storms (larger than the Earth) that have raged for centuries. 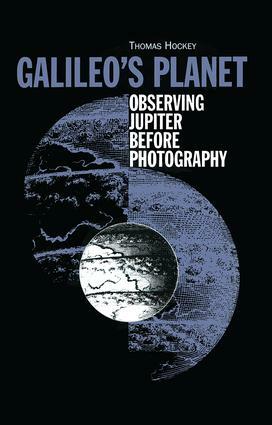 Galileo's Planet: Observing Jupiter before Photography presents the history of humankind's quest to understand the giant planet in the era before photography, a time when the only way to observe the universe was with the human eye. The book provides a comprehensive and fascinating account of the people involved in this quest, their observations, and the results of their findings. Many of the planetary features studied in detail by today's space probes were once glimpsed by keen-eyed, amateur astronomers. These Earth-bound explorers made up for their modest instruments and viewing conditions with their patience, perseverance, and passion for the night sky. Their greatest challenge was the fifth planet from the Sun and the search for its imagined surface-a revelation of the "real Jupiter." In the process, these part-time observers redefined the meaning of the word "planet." The book recounts their story from the earliest times right up until the invention of the camera. "Hockey, an astronomer with well-developed historical sensitivities, surveys in this volume observational investigations of Jupiter from antiquity until the time, around 1880, when photography fundamentally altered how astronomers viewed the planets. He has a story very worth telling. His account should simultaneously satisfy astronomers seeking information on telescopic reports of changes on Jupiter and also historians of science searching for an accessible narration that does justice to the broad context of such observations."